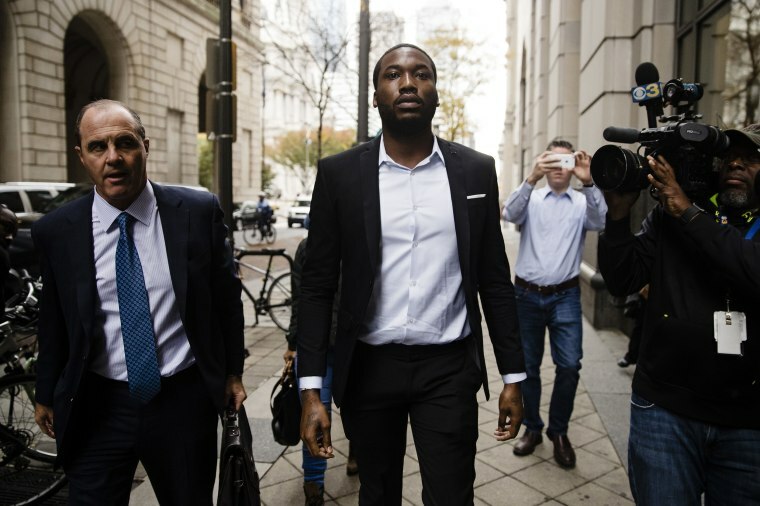 A Pennsylvania court has denied rapper Meek Mill’s request to be freed from prison and allowed to post bail. The state’s Superior Court on Tuesday denied the request from lawyers representing the 30-year-old rapper, whose real name is Robert Rihmeek Williams, and instead directed the Philadelphia Court of Common Pleas Judge Genece Brinkley, who has been handling the case, to issue a decision on the lawyers request. "We are pleased that the Superior Court took immediate action to direct the Court of Common Pleas to decide on the application for bail "without further delay," said Joe Tacopina, an attorney for Mill in a statement to NBC News. "We remain hopeful that Mr. Williams will be promptly released on bail." The Philadelphia-nativewas sentenced earlier this month to two to four years in prison for violating probation on a roughly decade-old gun and drug case. The sentence came despite recommendations from Mill’s probation officer and a prosecutor that Mill not be jailed. Mill’s legal team previously has asked for his release and for Judge Brinkley to be recused from his case because she "can't be just and partial." Civil rights activist and MSNBC host Rev. Al Sharpton met with Mill at the prison in Chester, Pennsylvania, on Monday and also called for Brinkley to "step aside" from the case.